Based upon a novel by Shannon Hale (2007), I went today with little expectation. 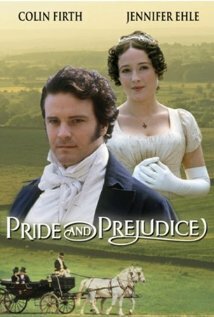 except for my abundant obsession with Jane Austen's books (all of them) and the A&E' Pride and Prejudice series made in the 90's which starred Jennifer Ehle and the sexiest man who has ever been written, Mr. Darcy, aptly played by the sexiest man who has ever lived, Colin Firth. This movie is a delight. If you are Austen fanatic like me you'll relish every moment. Austenland tells the story of 30-something Jane Hayes, an average New York woman who secretly has an unhealthy obsession withMr. Darcy from the BBC adaptation of Pride and Prejudice. But after Jane accidentally reveals her secret to a great aunt, who shortly after dies, Jane gets the opportunity of a lifetime. In her great aunt's will, Jane's great aunt leaves Jane a trip to a Jane Austen–themed getaway destination where Jane hopes to meet her own real life Mr. Darcy. 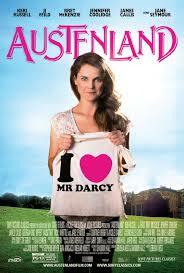 While at "Austenland", Jane is plagued with self-doubt about pretending to be a woman from the Jane Austen era. However, along the journey Jane makes new friends and finds a new romantic interest. (click here). The protagonist of this film, Jane Hayes is played supremely by Kerry Russell (one of my favorite independent films, "Waitress" starred her in 2007....check it out.) This film is really an ensemble triumph. Although one actress little steals the show. She does so in every film that I've seen her in. She is always typecast. She can play her this character better than anyone ever. I have a great deal of respect for her talent and her work. I'm talking about Jennifer Coolidge who plays another guest at Austenland. I should make this caveat......if you're a serious film critic or you take things overly serious, you should probably not see this movie. I do not mean to diminish it's excellence in any way. But it is a very clever farce (if you are into Jane Austen/Mr. Darcy) and it is perfectly cast. Lot's of fetching male eye candy too. If that's what suits your fancy.